Saturday, October 24, 2015, Fayetteville, Southern Writers Symposium at Methodist University, NCLR Editor Margaret Bauer will give a presentation on "Seeing Behind the Curtain: From Submission to publication in NCLR"
NCLR Fiction Editor Liza Wieland will read from her new novel, Land of Enchantment. by Elizabeth Jackson, with short readings by both poets. North Carolina Literary Hall of Fame Induction Ceremony (NCLR Editor Margaret Bauer will be at the exhibit table selling issues and subscriptions. (7/2/2014) Press release for NCLR 2014 print issue. (5/18-19/13) Asheville Renaissance Hotel in Asheville, NC – 34th annual Thomas Wolfe Society conference meets for the 75th anniversary of Wolfe’s return home. More details and a call for papers available here. (5/9/13) North Carolina Museum of History in Raleigh, NC, 12pm – NCLR Editor Margaret Bauer will speak on Paul Green’s 1931 play The House of Connelly and its 1934 film adaptation Carolina. (4/27/13) Elliot University Center at UNCG (Maple Room), Greensboro, NC, 7:30pm – Applewhite Prize Winner and finalists will read poetry before the NCWN Spring Conference begins the next day. (4/20-21/13) Lillington, NC and Campbell University, Buies Creek, NC– The festival will feature: music, drama, barbecue, readings, papers, activities for Harnett County students, and a baseball game! Full schedule available here. (4/19/13) Greenville Country Club, 6:30pm - Margaret Maron will be the speaker at the Friends of Joyner Library spring banquet. Ticket information can be found here. (3/29/12) Vanderbilt University, Nashville, TN – Panel on NCLR’s 20th Issue at Biennial meeting of the Society for the Study of Southern Literature. Also, NCLR Editor Margaret Bauer will present a paper on NC writer Kat Meads. Founding Editor Alex Albright will present a paper on A.R. Ammons' "Corson's Inlet." Full conference schedule here. (2/7/12) Joyner Library, 7pm - Stephen Burt, poet, critc, and Professor of English at Harvard will read from his own poetry and answer questions about the creative relationship between poetry and criticism. More details here. (2/3/12) Mendenhall Student Union Building at East Carolina University, 9am-6pm - ECU hosts the inaugural New Voyages to Carolina Conference, is “The First North Carolina.” The keynote speaker is Bland Simpson. Other presenters include: Lindley S. Butler, David Cecelski, Stephen D. Feeley, Michelle LeMaster, David Moore, and more. More information can be found here. (2/2/12) Wright Auditorium at East Carolina University, 7pm - Bland Simpson, Distinguished Term Professor of English and Creative Writing at the University of North Carolina at Chapel Hill and NCLR Contributor, is giving a lecture on Thomas Harriot as a part of the ECU Voyages of Discovery Lecture Series. (1/25/12) Regulator Bookstore in Durham, NC, 7pm – Readings by Doris Betts Fiction Prize competition winner/finalists: 2011 winner Robert Wallace, two-time 2nd place winner Gregg Cusick, and 2009 finalist Melanie Raskin. Learn more about this short story contest, sponsored by the North Carolina Writers Network and managed by NCLR. Video highlights from the reading. (1/20/12) City Art Gallery in Greenville, NC, 6-8 pm – Opening of the second annual Applewhite Show, a collection of art based on the poems of James Applewhite, featuring a reading by the poet. (11/18/11 - 11/20/11) DoubleTree Hotel Asheville-Biltmore, Asheville, NC, 5pm- The semi-annual conference for the North Carolina Writers' Network. The conference will feature workshops, faculty readings, panels, luncheons, a keynote address by novelist Silas House. (11/18/11) North Carolina Literary and Historical Association Annual Meeting will feature keynote speaker Michael Parker. The event will also include a panel celebrating "Twenty Years of NCLR." Panelists will include Janet Lembke, whose essays appeared in both the first and twentieth issues; Editor Margaret Bauer; and Art Director Dana Gay; moderated by Associate Editor Lorraine Robinson. More details coming soon. (9/13/11) Sheppard Memorial Library, Greenville - NCLR Editor Margaret Bauer will talk about Ron Rash's Serena. (9/10/11) City Lights Bookstore, Sylva, NC - NCLR 2011 publication party at City Lights Bookstore in downtown Sylva, featuring writers from the issue: Kathryn Stripling Byer, Catherine Carter, George Ellison, Brent Martin and more. (9/7/11) East Carolina University’s Joyner Library, Greenville – Inaugural Exhibit: Announcing the Stuart Wright Collection, featuring Distinguished Poet Fred Chappell and English Department Associate Professor Thomas Douglass. (3/31/11 - 4/2/11) Lafayette – NCLR Editor Margaret Bauer returns to her home state to participate in a panel on publishing at the Louisiana Conference on Literature, Language & Culture. (3/24/11) East Carolina University’s Wright Auditorium, Greenville, 7pm – Ms. lebame houston will present "A Briefe and True Report of The Lost Colony Drama in the New Found Land of Virginia" as part of the Thomas Harriot College of Arts & Sciences Voyages of Discovery Lecture Series. (2/22/11) Martin Memorial Library in Williamston, NC – NCLR Editor Margaret Bauer speaking on The Marrow of Tradition by Charles Chesnutt at 7 pm, the first book in the Writers from North Carolina’s Literary Hall of Fame series, part of the North Carolina Humanities Council’s Let’s Talk About It reading program. (2/2/11 - 2/5/11) Washington, D.C. – NCLR Fiction Editor Liza Wieland will be attending the 2011 AWP Conference & Bookfair. (1/13/11) City Art Gallery in Greenville, NC, 6-8 pm – Opening of "APPLEWHITE"...a collection of art based on the poems of James Applewhite, featuring a reading by the poet. (12/7/10) Greenville Museum of Art, 5-8 pm – NCLR Editor Margaret Bauer speaking on Eastern North Carolina’s Kat Meads at ECU’s Downtown Dialogues in the Humanities. Read more. 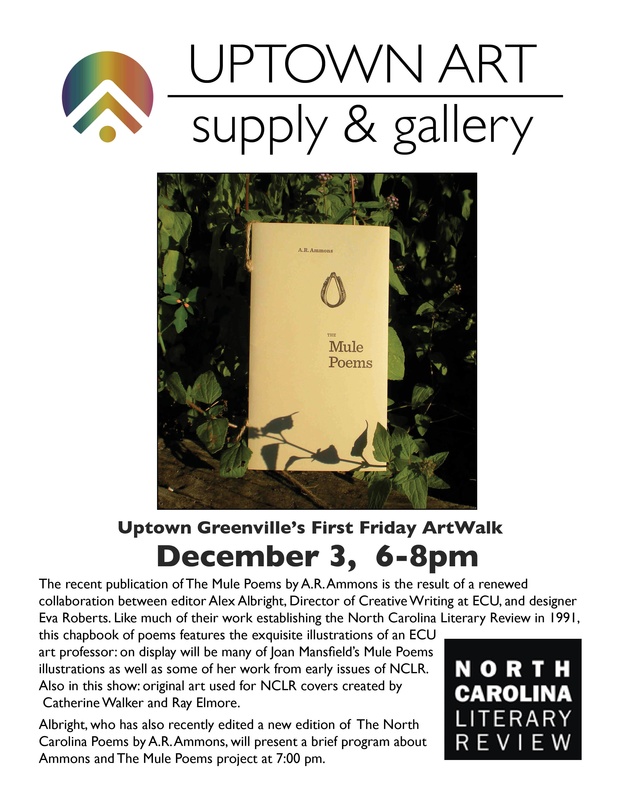 (12/3/10) UBE in Greenville, NC 6-8pm – NCLR is participating in Uptown Greenville's 1st Friday ArtWalk,	featuring Joan Mansfield's illustrations for A.R. Ammons's Mule Poems, edited by NCLR founding editor Alex Albright, and other NCLR artists. (11/14/10) Qual Ridge Books in Raleigh, NC - NCLR Founding Editor, Alex Albright will be at Quail Ridge Books for "A.R. Ammons: A Celebration with Friends." We'll be celebrating a new edition of the North Carolina poems and a new collection of Ammons's mule poems, both of which Alex edited, the latter designed by the original NCLR Art Director Eva Roberts, with art by Joan Mansfield, who has contributed art to several issues of NCLR. Back issues of NCLR featuring Ammons poems will be available for purchase. (11/5/10) - (11/7/10) Charlotte, NC - NCLR attended the North Carolina Writers' Network 25th Anniversary Conference. (10/19/10) Rocky Mount, NC - For the North Carolina Humanities Council’s Let’s Talk About It series, at 6 pm at the Braswell Memorial Library, NCLR editor Margaret Bauer will lead a discussion of Pamela Duncan’s novel Plant Life. (10/17/10) Southern Pines - NCLR will be sold at Weymouth Center before the North Carolina Literary Hall of Fame Induction ceremony. (10/1/10) Boiling Springs, NC - NCLR joins Gardner-Webb University in celebrating Ron Rash at the Southern Appalachian Culture Series conference. Editor Margaret Bauer will moderate a panel of writers talking about Rash’s work, including Silas House and Pamela Duncan (both of whom are in NCLR 2010). NCLR will be available for sale by Fireside Books and Gifts. (9/20/10) NCLR 2011 to feature environmental writing. (9/17/10) - (9/18/10) Greenville, NC - Join us at East Carolina University for the Eastern North Carolina Literary Homecoming. (9/11/10) Winston-Salem, NC - NCLR is going to Winston-Salem for two events! 7-9 pm: NCLR and Press 53 Celebrate the Publication of NCLR 2010, featuring Appalachian Writers of North Carolina. Join us downtown at the Community Arts Café, 411 W. 4th St., for readings from the new 2010 issue (by James Applewhite and Steve Mitchell), a book sale and signing, and conversations with the editors and writers. (9/7/10) Greenville, NC - At 7:00 pm at Sheppard Memorial Library, NCLR editor Margaret Bauer will lead a discussion of Pamela Duncan’s novel Plant Life. Come talk about the book—and then meet Duncan in Greenville on September 17-18 at the Eastern North Carolina Literary Homecoming. (8/14/10) Asheville, NC - NCLR is going to Asheville for two events! 10am-4: At the Thomas Wolfe Memorial, NCLR will participate in the North Carolina Arts Council’s 2nd Saturdays. Since the museum staff is focusing on "Thomas Wolfe’s artistic medium of the drama and narrative prose as his preferred method of creative expression," the NCLR editor will bring copies of the 2009 "Drama" issue for sale, as well as the new 2010 Appalachian issue, at special event prices. 7-9pm: NCLR 2010 Publication Party at Malaprop’s Bookstore in Asheville (7:00 p.m., 55 Haywood Street). Join us for readings from the issue and lots of thank yous—to Malaprop’s, who has sold NCLR for years; to Blue Spiral 1 Gallery in Asheville, who gave us the Will Henry Stevens art on the cover and throughout the issue; and to Pack Memorial Public Library, who helped us find historical photography for the issue. Readings by Charles Dodd White, author of "Controlled Burn," a short story in the Appalachian section of the 2010 issue, as well as by poets doris davenport, Lynda Self, and Sandra Ann Winters. Kathryn Stripling Byer has also indicated that she may be there! (7/30/10) Chapel Hill, NC - Editor Margaret Bauer and Fiction Editor Liza Wieland are going to the North Carolina Writers Conference to celebrate Bland Simpson—and with copies of the new issue for sale. (7/23/10) Raleigh, NC - Editor Margaret Bauer speaking at the North Carolina Writers Network’s Squire Summer Writing Residency at Peace College. And she’s bringing copies of the new issue, hot off the press, for the book sale! The 2008 and 2009 Betts Fiction Prize Winners will read their winning stories and talk about submitting to the Betts Fiction Prize competition at Park Road Books in Charlotte, NC, January 28 at 7 pm. For details, see the press release. 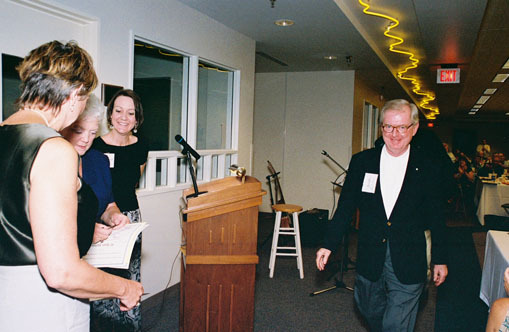 The North Carolina Literary Review editors and staff are deeply saddened to report the death of W. Keats Sparrow (photographed receiving the Roberts Award for Literary Inspiration at the 2007 Eastern North Carolina Literary Homecoming) on November 11, 2009. In the obituary announcement she wrote for the ECU community (and later delivered at his funeral), NCLR Associate Editor Lorraine Robinson relates the inscription honoring Sir Christopher Wren in London's St. Paul's Cathedral to Keats’s many contributions to the preservation of North Carolina’s rich literature and history: Si monumentum requires, circumspice — "If you would see the man's monument, look around you." During his career at East Carolina University, Keats was involved in almost every North Carolina cultural and literary activity, and his leadership and dedication will be sorely missed. The North Carolina Literary Review staff sends sincere condolences to the family of Keats Sparrow and to the many friends who mourn his loss. 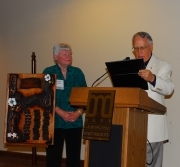 Read Keats Sparrow’s obiturary to learn more about his numerous contributions to North Carolina literature and history. (11/17/09) NCLR Fiction Editor Liza Wieland reading from her new novel, A Watch of Nightingales, at the Downtown Dialogues NCLR Fiction Editor Liza Wieland reading from her new novel, A Watch of Nightingales, at the Starlight Cafè in Greenville, November 30. This reading is part of the Downtown Dialogues, sponsored by East Carolina University's Division of Research and Graduate Studies. Advance registration is requested but not required. (11/1/09) Liza Wieland, Alex Albright, Christy Hallberg, and Bob Siegel reading at East Carolina University NCLR Fiction Editor Liza Wieland, Founding Editor Alex Albright, and editorial board members Christy Hallberg and Bob Siegel will be reading at East Carolina University on November 18: 7:30 pm in Bate 1031. The ECU Creative Writing program is conducting a food drive at this event to aid the the Food Bank of Eastern and Central North Carolina, so please bring a non-perishable food item to donate. The North Carolina Literary Review is proud to announce that Lee Zacharias's essay "Geography for Writers," published in the Flashbacks section of NCLR 2008, has been selected as a Notable Essay in the 2009 edition of Best American Essays. Congratulations to Lee! (9/28/09) North Carolina Literary and Historical Association is Holding its Annual Meeting "Down East" this Fall The North Carolina Literary and Historical Association is holding its annual meeting "Down East" this fall—in New Bern, November 13-14. Come and meet NCLR's Editor, Margaret Bauer, finishing up her two-year term as "Lit & Hist" President; and our Fiction Editor, Liza Wieland, who will be one of the award presenters. Hear Bland Simpson talk about musician's theater, which he wrote about for our 2009 issue's drama section. And past NCLR contributor David Cecelski will be giving the keynote address. Go to the full program and registration information from here, and mark your calendar. The North Carolina Literary Review will celebrate the release of its 2009 issue at Quail Ridge Books in Raleigh on Friday, October 30, at 7:30 p.m. Poet Betty Adcock, interviewed in this issue, will read from her work, and Bland Simpson will talk about his article on musician's theater. Then Americana music legends The Red Clay Ramblers will join band mate Simpson for a set of songs and tunes. NCLR editorial staff will be at the Eastern North Carolina Literary Homecoming to sell issues and subscriptions this coming weekend, September 25 and 26. Great deals on back issues featuring the event's guest writers. For more information about this East Carolina University annual event, go to: www.ecu.edu/lithomecoming. Dana has designed for NCLR since she was a student of the original Art Director, Eva Roberts. She is now on the faculty at Meredith College in Raleigh.See the new look she has given NCLR with the 2009 issue. Read about her vision inside the issue. Find out more about Dana at www.danagay.com.